f you pass by the winding streets of Moira and Aldona on any given Sunday, don’t be surprised to see rows of black garbage bags forming a neat pile and a motley group of unassuming youngsters with their backs to the road working tirelessly on a hot afternoon. You wonder why they’d put themselves through this ordeal and at the same time marvel at how wonderful these streets look, thanks to their hard work. 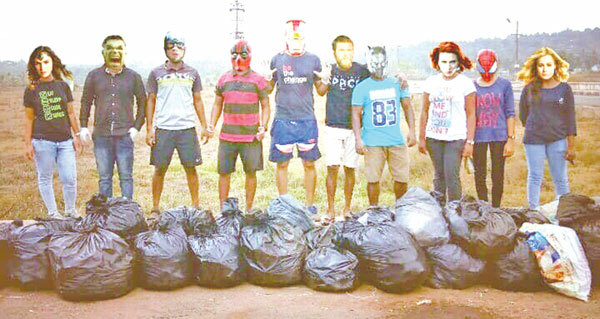 One often hears and participates in the usual lamenting of Goa gone lame on several fronts, especially with respect to the garbage issue with visible mounds of garbage creating an eyesore in otherwise picturesque village roads. Other than armchair criticism and willful indignation against government apathy, most of us shake our heads and move on. The onus of keeping our roads and culverts clean cannot lie in the hands of lay persons who will at some point lose their enthusiasm and zeal. This first step as a citizen’s movement has brought awareness and raised pertinent questions. It is now imperative that local bodies act in addressing this issue by installing garbage bins, ensuring collection and more importantly penalizing those who continue to trash. The idea of ‘Swachh’’ Bharat may be a more cumbersome process but the vision of retaining a ‘sobit’ Goa is up to each one of us. These young millennials have made an onerous start.